Photography by Chi Chi Ari at the Salamander Resort and Spa in Middleburg, Virginia. Artistry using Anemone and gorgeous greens. Photography by Izzy Hudgens. Burgundy Ranunculus with Astilbe. 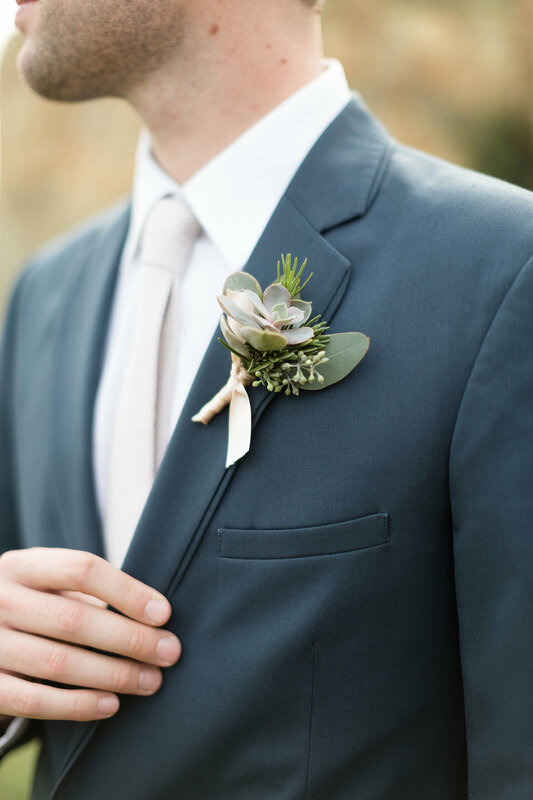 A boutonniere is really a way for you, the groom or pair of grooms, to express yourself, even if just a little. Your goal is to add a bit of flash to your lapel for this very special day. Here’s a look at some boutonnieres that we made in 2018 and some things to consider as you create your design. Pamela Lepold Photography, pink, white and a hint of green. 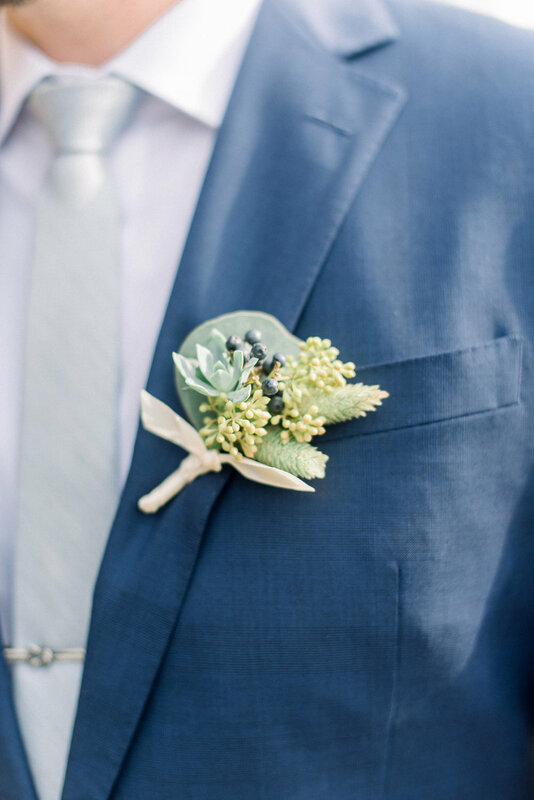 We will help you to choose blooms for your boutonniere from the flowers that you and your intended have chosen to use throughout your wedding décor. You may like the idea of using a signature flower for your boutonniere from the bridal bouquet recipe that can become a unifying element for your ensembles. You don’t have to use a bloom from the bouquet, but it’s a good idea to use a flower from one of the recipes that we will create for your overall wedding. Flowers are sold in bunches and your budget will go further if we aren’t ordering a special stem for your boutonniere. A longer thinner boutonniere with Calla Lily and Blue Delphinium. Fisher Photography. Because we will be a whole cast of blooms to accomplish different designs for the wedding, you can choose to make the boutonnieres for the groomsmen different than your own. You could pick a different color in the same floral variety or use an entirely different flower in the same shade (a similar strategy can be used for the bridesmaid bouquets). If you don’t have want to select a specific flower, our designers will use their combined decades of wedding floral design experience to create something really special for your lapel from the list of flowers you and your partner have selected. 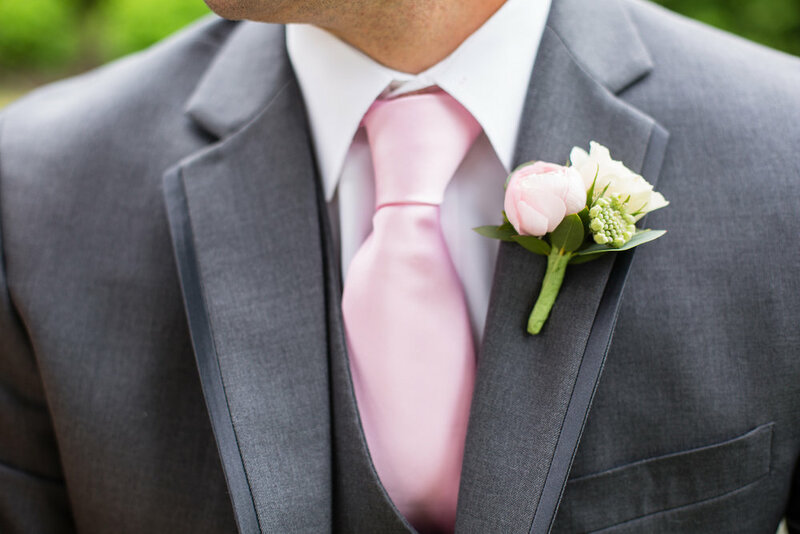 Should you provide boutonnieres for the men in your family? Candice Adele Photography, Succulent, Fern and Eucalyptus. Many wedding couples ask me if it necessary to provide a flower for the male members in their family. The answer would have been a hard yes in the last century, but now, it’s really up to you. A flower is a lovely way to honor the men and women that made this day possible. But, weddings are a little less formal these days. Some guests familiar with the traditions of the last century will expect to see corsages and boutonnieres. They may also expect to do the electric slide and the chicken and see some other rituals that modern couples have chosen to eliminate. Did you know that each guest used to pay a dollar to dance with the bride so that the newlyweds had a little cash for their honeymoon? And, you haven’t lived till you’ve spent a half hour on the end of a receiving line. Speaking of receiving lines, if you’re having one, let’s add a second boutonniere for the groom or plan to have him hang his jacket on a chair. Flowers are hardy, but one hundred and fifty hugs can spell disaster for a bloom. Candice Adele Photography, Thistle and Privet with Eucalyptus and Smokebush. As wedding floral budgets go, boutonnieres average around $20 to $25. They include several stems with one or two blooms, a couple of pieces of green, ribbon and some hidden floral materials. They are, however, labor intensive and require skill. Our team works hard to make each one look like little piece of art. I used several pictures of boutonnieres in this blog that do not include flowers. Weddings made entirely from greens are trendy but still fairly rare. Most brides and grooms have at least a few flowers in their personals (feel free to go all out on the greenery). As a groom, you can definitely choose to use only greenery. We can use Succulent, Thistle, Dusty Miller, Fern, Rosemary or even Sage to create something very unique. This is a great look and still works well with a floral bouquet. The conversation about your boutonniere begins in the creative consultation that we will have in our studio. You’re gonna look great, just you wait.